Sun Z, Amourda C, Shagirov M, Hara Y, Saunders TE, and Toyoma Y. (2017). Basolateral protrusion and apical contraction cooperatively drive Drosophila germ-band extension. 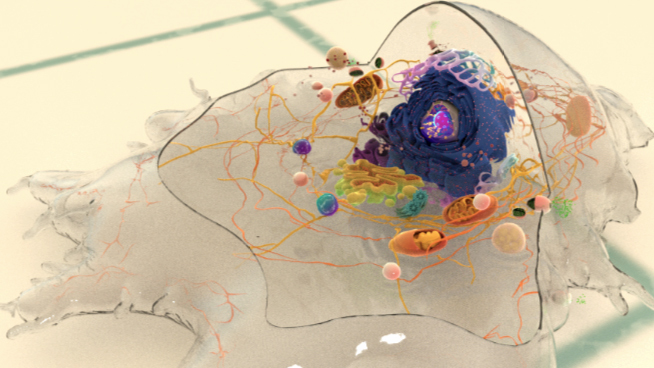 Nature Cell Biology. 19(4): 375-383. doi: 10.1038/ncb3497. Germband extension is a tissue remodeling event that occurs during the gastrulation stage of the Drosophila embryonic development. During this process the germband, which is the region of the embryo that gives rise to various segments of the body, doubles in length along the anterior-posterior axis while simultaneously narrowing down along the dorsal-ventral axis through a series of cellular rearrangements. 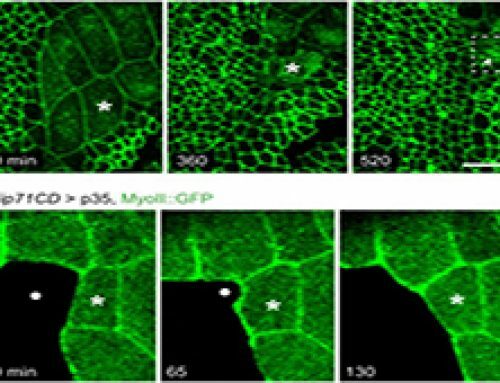 Cell intercalation is the most prominent type of cellular rearrangement driving Drosophila germband extension. Intercalation is accompanied by the formation of rosette-like patterns on the apical sides of cells along the anterior-posterior axis, which is driven by actomyosin contractions and apical junction reorganization events. However, the dynamics occurring on the basal region of cells were largely unknown. In this study, Sun et al have used live imaging of embryos to reveal the formation of rosette patterns on the basolateral sides of cells during germband extension, and specifically, cell intercalation. In most cells, basolateral rosettes are seen to form earlier than the apical rosettes. The formation of basolateral rosettes are initiated by the dorsal most and ventral most cells of the cell cluster, which put forth actin-based, wedge-shaped protrusions at their cell fronts. The protrusions facilitate the movement of the two cells towards each other along the dorsal-ventral axis, causing the neighboring cells to realign into a rosette pattern on the basolateral side. What functions does actomyosin have in non-muscle cells? 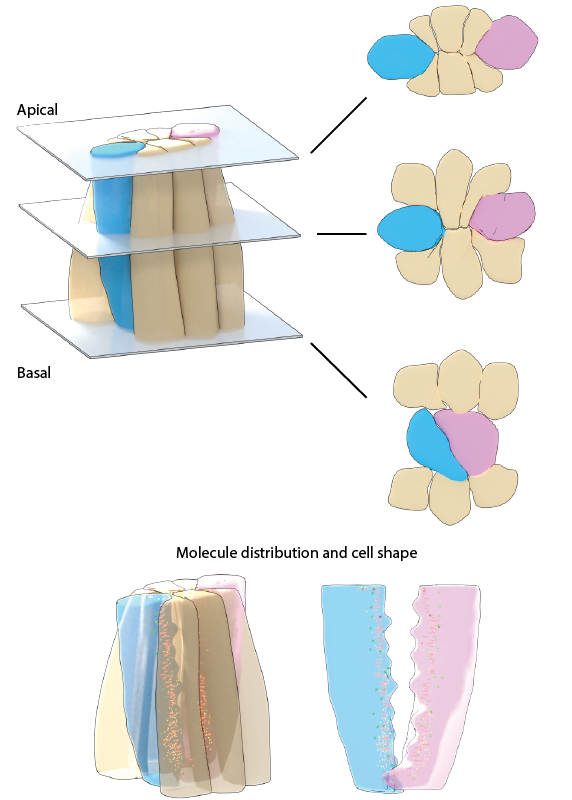 What is the role of cell-cell adhesions in driving morphogenetic events during development? Non-muscle myosin II isoforms have a similar structure and function to their muscle equivalents. However, their interaction with actin serves to generate cellular forces rather than muscular contraction. During non-muscle actomyosin contractility, non-muscle myosin II uses energy from ATP hydrolysis to slide the actin filament to produce contractile force, and these forces have been implicated in multiple cell functions, such as cell adhesion, establishing cell polarity, and cell migration. During cell division, actomyosin contractility regulates forces on the nucleus which affect DNA synthesis and chromatin organization, and is also required for formation and contraction of the mitotic spindle. Actin filaments are the primary cytoskeletal component to drive cell motility. Actin filaments found in membrane protrusions such as filopodia and lamellipodia rapidly assemble and disassemble. These cellular structures are essential in cell migration and are predominately found at the leading edge of a moving cell. 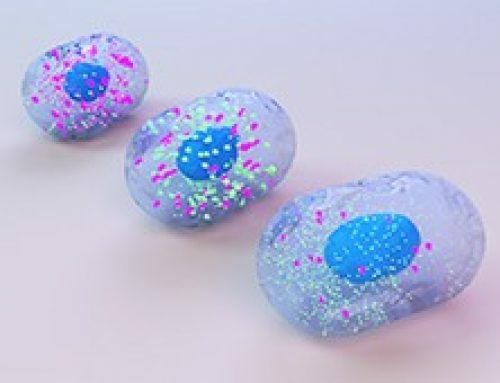 They also allow the cell to probe or sense its microenvironment. Actin filaments are also found at the trailing edge in the form of the cell cortex, which lies adjacent to the plasma membrane. More stable arrays of actin filaments, such as those found in stress fibers, allow a cell to brace against the underlying surface. Actin-associated myosin motor proteins use ATP hydrolysis to exert forces against the stress fibers during muscle contraction; the energy of hydrolysis can also be converted to tensile forces at the trailing cell edge to promote edge retraction in motile cells. 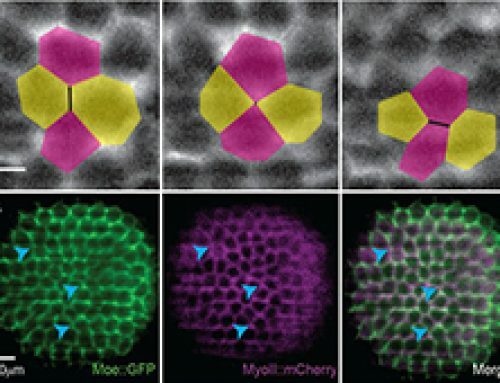 During germband extension in Drosophila embryos, cell intercalation is accompanied by the rearrangement of cells into rosette patterns on their basolateral sides, in addition to the formation of apical rosettes that have been previously described. The basolateral rosettes, in most cases, form earlier than the apical rosettes. The formation of basolateral rosettes is initiated by dorsal-most and ventral-most cells in the cluster, which polarize along the dorsal-ventral axis and put forth wedge-shaped, filopodial or lamellipodial protrusions at their cell fronts. The protrusions facilitate the active migration of dorsal and ventral cells towards each other along the dorso-ventral axis, causing the neighboring cells to realign into a rosette pattern. The formation of apical rosettes and basolateral rosettes occur independently of one another. However, cellular dynamics at both these regions collectively drive cell intercalation and germband extension in Drosophila. The basolateral protrusions are chiefly actin-based structures. 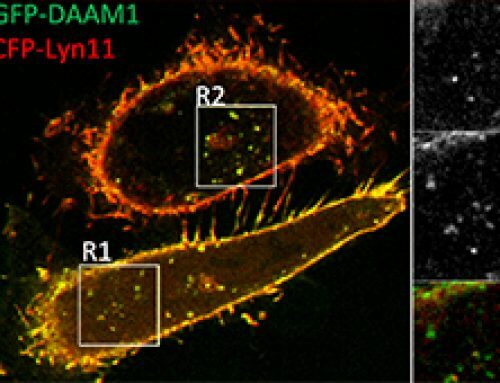 This is supported by live imaging studies that confirmed the presence of high levels of actin near the protrusions at the front of dorsal and ventral cells during basolateral rosette formation. The formation of actin-based basolateral protrusions is dependent on Rac GTPase activity, which is seen to co-localize with actin near the protrusions during rosette formation. The involvement of Rac1 in the formation of protrusions were confirmed by expressing dominant-negative Rac1, which caused the protrusions to retract and prevented the formation of basolateral rosettes. The study identified Src kinase as a potential regulator of basolateral rosette formation. High levels of phosphorylated-Src is seen to co-localize with actin near the basolateral protrusions. Inhibition of Src42A by the use of siRNAs or other approaches leads to disruption or delay in the formation of basolateral rosettes and germband extension is impeded. Myosin-II (MyoII) is involved in actomyosin contractility and rosette formation only on the apical sides of dorsal-ventral cells, as seen by its accumulation at the apical cell borders, but not on the basolateral sides. The study shows how basic morphogenetic events such as germband extension in Drosophila are driven by active coordination of cellular dynamics at the apical and basolateral sides of cells along the anterior-posterior axis. Considering that both the actomyosin contractions on the apical side and actin-based protrusions on the basolateral side are oriented along the dorso-ventral direction, future work will be aimed at identifying factors, such as cell polarity proteins or guidance cues, that may determine directionality during cellular dynamics and the organization of cells into rosette patterns. 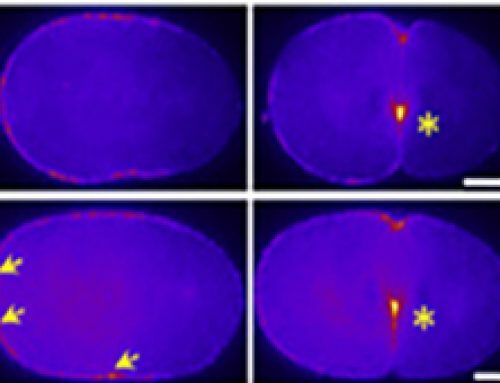 The findings from this study could then be applied to better understand the mechanistic details that underlie morphogenetic events in other embryonic systems, such as C.elegans dorsal epidermis intercalation and Xenopus mesoderm mediolateral intercalation.